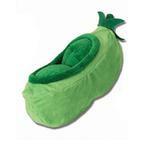 Show your dog some love with the TreatRageous Hide-a-Treat Peapod Dog Toy! This fun interactive dog toy has a soft crinkle shell that looks like a Peapod. The two plush squeaker balls inside will please your pup on their own but can also be removed and replaced with dog treats. This is a great interactive dog toy that helps eliminate boredom and promotes proper chewing habits.